On Thursday, September 19, 1991, at about 1.30 p.m. on a sunny afternoon Erika and Helmut Simon, from Nuremberg in Germany, were enjoying the last day of a vacation half-walking and half-climbing through difficult icy and rock-strewn terrain high up on a mountain overlooking the Ötz valley in the Alpine borderlands between Austria and Italy. On their descent from a peak near Tisenjoch they strayed a little from the recommended route in the hope of finding a short cut and, as they traversed a rock-strewn elevated plateau near a retreating mountain glacier at some 3210 meters above sea level, they passed a gully filled with thawing ice and melt-water within which they noticed something unusual. Further investigation showed this object, which Helmut Simon at first, and from a little distance, thought to be a "doll's head", to be an actual human corpse. Much of these human remains lay under the ice and melt-water but the back of the head and upper back and shoulders were exposed - the Simons also noticed several pieces of rolled-up tree bark near the body and took a picture of what they now presumed to be the unfortunate victim of some sort of, quite recent, accident on the mountain before leaving to report their find at a nearby hiker's shelter. No more pictures were taken that day because their camera used rolls of photographic film and when they discovered the body their camera's roll of film was nearly used up. The Simons' story featured some years later on "Death of the Iceman" an episode of the BBC2 "Horizon" popular science show first shown 9.00pm Thursday 7 February 2002. ERIKA SIMON: My husband walked in front of me a bit and then suddenly he stopped and said look at what's lying there and I said oh, it's a body. Then my husband took a photograph, just one, the last we had left in the camera. HELMUT SIMON: We thought it was a mountain climber or a skier who'd had an accident perhaps 10 years previously or perhaps two years previously. The owner of the hiker's shelter, which was located close to the Italian frontier with Austria, called the police on both sides of the border. The Italian carabinieri, believing the body was that of an ill-fated climber, showed no interest. Their Austrian counterparts, who had already pulled eight corpses out of glaciers that summer, said they would investigate by the next afternoon. The following day, an Austrian policeman arrived by helicopter and attempted, with the assistance of a mountain rescue keeper, to free the body with a pneumatic jackhammer. The task was made difficult by the presence of quantities of icy melt water and the powerful tool they were using actually chewed up the Iceman's garments and even ripped into his left hip, exposing the bone. In the event this recovery attempt was curtailed as the pair ran out of compressed air to power the jackhammer. A curiously-fashioned axe they discovered near the corpse was taken to a gendarmerie post in Sölden. The Austrian authorities decided to wait until the following week to resume the recovery; the helicopter, they explained, was needed for more important things. Over following days word of the discovery spread and several persons whose curiousity had been aroused proceeded to the discovery site. Many items were recovered by the mountain rescue worker who returned to the site on Sunday 22 September. One of the on-lookers used a pickaxe in further attempts to free the body from the melting ice. Overnight, however, the temperature dropped. By the time Innsbruck forensics expert Dr. Rainer Henn arrived to investigate the death, on Monday, Sept. 23, the body was again locked in ice. Having neglected to bring tools, Henn and his team resorted to hacking it out with a borrowed ice pickaxe and ski pole. Whilst the frozen body itself was being removed under the supervision of the forensics expert the process was being recorded on film by a film crew brought to the site by news of the unusual find. The remains were then taken from the mountain by helicopter to the town of Vent in the Austrian Ötz Valley and then on to the Institute of Forensic Medicine in Innsbruck, Austria. Fatalities occur every year in the high alps due to such things as climbing accidents, exhaustion, adverse weather or sudden deaths. The bodies of such victims are often recovered shortly afterwards but they can also subsequently disappear into the snowy landscape. Although some eight bodies had already been recovered from the high alps already in 1991 an archaeological expert was called in to give advice in this particular case because some of the artifacts discovered with the body seemed to be potentially very ancient. It was only then, after five days of heavy-handed mistreatment, that the Iceman was given professional assessment. Arriving at the Institute of Forensic Medicine, Konrad Spindler, head of Innsbruck's Institute for Prehistory, was stunned, immediately realizing the significance of the shriveled body. "I thought this was perhaps what my colleague Howard Carter experienced when he opened the tomb of Tutankhamen and gazed into the face of the Pharaoh." By the time Dr. Spindler arrived at the Institute of Forensic Medicine the Iceman's remains had become the centerpiece of an informal press conference. While the Iceman and his some of his tattered belongings lay on a dissecting table under blazing lights, reporters and other hangers-on joked, smoked and even touched the body. Not until late afternoon did someone notice a fungus spreading on the Iceman's skin. To prevent further damage, the body was bathed in fungicide, wrapped in a sterilized plastic sheet, covered with chipped ice and moved it to a refrigerated room at the university. There, except for 30-minute intervals when it was subsequently removed for CAT scans and other scientific tests, the Iceman was stored at 98% humidity and -6 degrees C (21.2 degrees F), the glacial temperature that it had grown accustomed to over the many, many, years prior to its discovery. Given this realisation of extreme archaeological significance the gully in which Otzi had been found was thoroughly investigated - - a process which involved much melting of ice. The various official and unofficial attempts at freeing the frozen body from the ice had, unfortunately, done harm which tended to somewhat lessen the potential archaeological value of the site. Numerous pieces of leather and hide, string, straps and clumps of hay were recovered and preserved for further study. International complications came into play as, although the body was discovered in a place where waters as they drained from this part of the Alps flowed towards Austria, its actual resting-place was confirmed, by a subsequent border survey of early October, to have been some 93 metres inside the Italian border. Agreements were reached between the relevant authorities allowing for the continued responsibility for the investigation of the corpse to lie with the Forensic Institute at Innsbruck. A dispute about "ownership" of Ötzi the Iceman, as the remains became known in an emerging world-wide fascination with this "cold case" of an ice mummy found on the Austrian-Italian frontier, continued for six years until, early in 1998, under armed guard, (because some Austrians had shown dis-satisfaction to see this relocation), Otzi and his belongings were transported from the Institute of Anatomy of the University of Innsbruck over the Brenner Pass to a new and purpose-built refrigerated resting place in a converted former bank building selected for its favourable location in the historical center of Bolzano - of an important town within Italy that was reasonably close to the actual discovery site: the conversion cost some €8,800,000 then roughly equivalent to $10,000,000. This converted building, (formerly a bank), is now known as the South Tyrol Museum of Archaeology and is located in the provincial city of Bolzano in Italy's largely German-speaking Alto Adige / Sud Tyrol / South Tyrol region. The gully in which the body was found had helped to preserve it, in its frozen state, from the immense weight of snow which seems to have covered the site for most of the several millenia since Ötzi, ( pronounced Oot-zee, and often actually spelled Oetzi ), lost his life. Ötzi's remains must have been claimed by icy cold quite soon after his demise as even his internal organs were found to be intact - they were able for instance to actually analyse his stomach contents which included ibex meat and primitively cultivated "einkorn" grains. 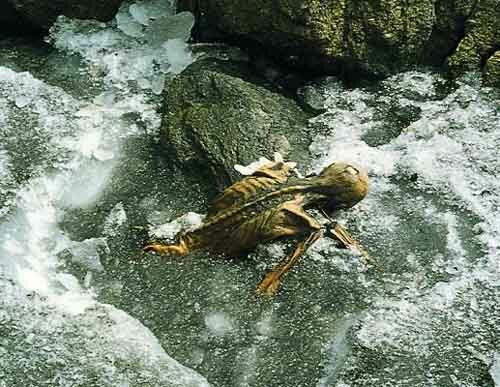 Over several years of subsequent investigation forensic findings relating to this frozen body in the Alps included the time of death as being some 5,300 years ago - in the late stone / early copper age! The deceased being a male of some 45 years of age with tattoos on his body and worn, but otherwise perfect, teeth and a probably quite troublesome infestation of intestinal whipworms. The deceased had come to a violent end - an arrowhead was found buried in the body and there was evidence of Ötzi having been heavily struck on the head perhaps with a blunt instrument or perhaps as the result of a fall. The medical examination held that either the arrow wound or the head trauma were sufficiently damaging as to cost Otzi his life. Based on the evidence of the several artifacts found together with the remains researchers now attribute a perhaps surprising degree of technological attainment to the Ötzi the Iceman and his late stone / early copper age colleagues. It was realised that those trying to recover the body had unwittingly trampled all over a hugely significant archaeological site and had even broken Ötzi's stone-age bow and the frame of his stone-age back pack, in trying to prize him from the ice. The above selection of items, (a bow made of yew and a quiver full of arrows were also recovered), include an axe with a handle of yew together with a refined copper blade held in place by leather strips and a type of tarry pitch derived from processed birch tree sap. In fact it was largely the finding of this 99.7% pure copper blade in circumstances which allowed dating to five thousand three hundred years ago that pushed back archaeologists previous assessment of the beginnings of the so-called "copper age" in Europe by a thousand years! Traces of copper and arsenic were found in Ötzi's hair consistent with some exposure to fumes from copper smelting. 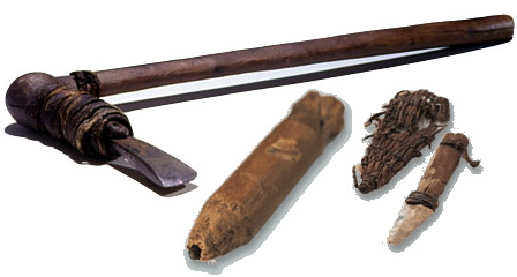 There is also a flint blade knife with its scabbard (on right), and the tubular item in the centre is called a retoucheur. This example of a retoucheur is an approximately 12 cm-long pencil-like tool for working with flint was made from a piece of lime branch which was shaped to a point at one end. At the pointed end an approximately 6 cm-long rod was driven into the central canal, leaving a few millimetres protruding. The rod turned out to be the fire-hardened point of a stag's antler. To fashion tools of flint, a flint cobble would first be hammered with hard blows to produce flakes and crude blades. These were then precisely shaped by pressing against the edge of the workpiece with a retoucheur to remove small fragments. The same method is used to resharpen dull edges. When the end of the retoucheur became blunt with wear, it could be sharpened like a pencil. As to the tattoos - one of several groups of vertical lines are located to the left and right of the spinal column. Others are on the left calf, on the right instep and on the inner and outer ankle joint, two further lines cross the left wrist. A cross-shaped mark appears on the back of the right knee and beside the left Achilles tendon. Later researchers considered that the tattoos may have been intended as therapeutic measures to hopefully combat arthritis rather than as decorative or religious symbols as, astonishingly, these tattooed areas seem to correspond to accepted skin acupuncture lines. Before Ötzi it was thought that this treatment had only originated two thousand years later in Asia. The remains of Ötzi the Iceman now lie in the Südtiroler Archeologiemuseum in Bozen / Bolzano in Italy's South Tyrol where they are stored in a nitrogen rich atmosphere under conditions of controlled temperature and humidity, which are designed to guarantee a constant temperature of -6 degrees Centigrade and a relative humidity of 98%, for their preservation but can be seen through a 40cm x 30cm viewing window by interested visitors. The space devoted to the Iceman occupies most of the first floor of the museum and consists of a decontamination room, an examining room, and two adjoining identical refrigeration chambers with independent cooling systems. The museum authorities consider, however, that they do try to treat his remains with respect and with scientific care - they also point out that after 5,300 years old they would not be able to bury him in accordance with the ceremonial customs of his own people. Besides which science can hope to learn much from Otzi in his present situation. Recent advances in the study of DNA, for example, have led to the decoding of Otzi's entire DNA genome, in 2010, from which Science can hope to learn important lessons about the development of modern man's genetically related susceptibility to certain diseases. Also as of 2010 the authorities in Italy's Sud Tirol / Alto Adige autonomous region were endeavouring to secure formal United Nations Educational Scientific and Cultural Organisation (UNESCO) heritage recognition for the importance of Ötzi the Iceman - official reconstruction, (dating from a science-based reconstruction of 1998 and still current as of 2010), pictured above. 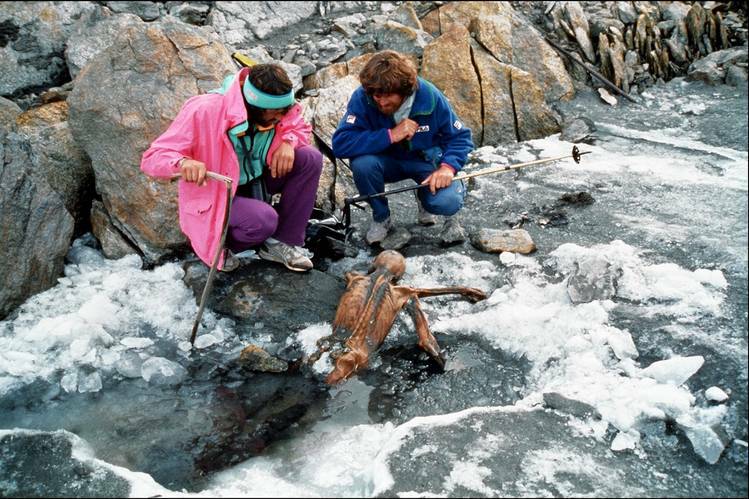 2011 was the 20th anniversary year of the Iceman discovery. 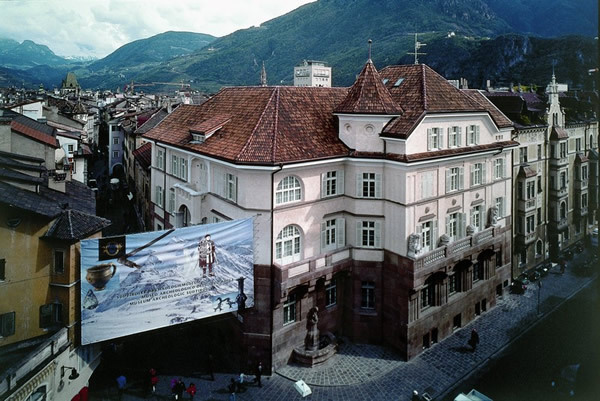 A major series of events was planned for an extensive Ötzi exhibition is to be mounted at the South Tyrol Archaeology Museum in Bolzano beginning on 1st March 2011 and to be continued until 15th January 2012. Acknowledged experts in reconstructive interpretation were engaged to assist in a project to re-present a new image of Otzi based on CAT scans, 3D images of the mummy's skull, infrared and tomographic images and other evidences. Over several months the new Ötzi reconstruction was a closely guarded secret. The veiled figure, pictured left (copyright © South Tyrol Museum of Archaeology / Oskar Dariz / Gruppe Gut), formed the main motif of the exhibition, and was intended to arouse curiosity about Ötzi's new appearance. 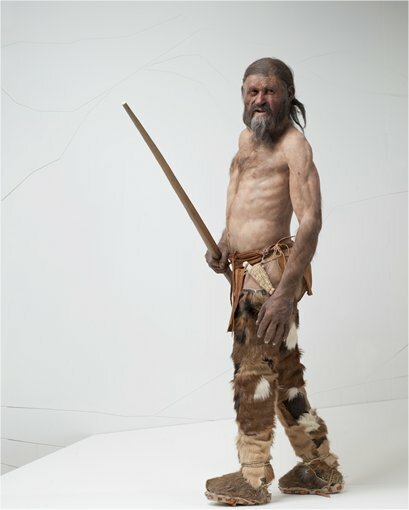 In late February, 2011, some previews of the new visualisation of Otzi's appearance became available. 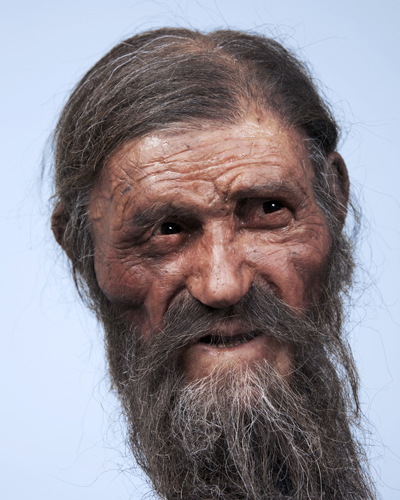 A reconstruction of the face and head of Otzi the Iceman as created by Dutch forensic experts Alfons and Adrie Kennis. The new reconstruction offers a vivid interpretation of Otzi as a late stone-age / early copper-age hunter. 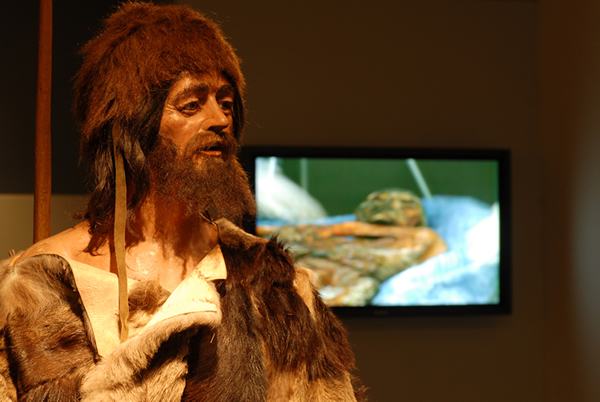 The reconstruction, as fully revealed on 1 March, depicts Otzi as having been a man of medium height, of a slight-yet-wiry body type, with narrow, sharp features, an unruly beard and tanned, weather-beaten, skin. "The aim of the (Ötzi 20) exhibition is to present a more rounded picture of Ötzi beyond the purely scientific aspect," museum director Angelika Fleckinger said in a statement. Anthropologist Albert Zink, head of the Institute for Mummies and the Iceman in Bolzano, Italy, who worked with forensic artists on the reconstruction, said that the new model is half naked only "to show that his body was muscular and well trained," and that "for sure, it would have been too cold to walk around like this, especially in the mountains." In 1994 the Italian authoritiies offered a "symbolic" reward of 10 million lire (5,200 Euros), to the Simons, (pictured left), for their part in Oetzi's discovery and recovery. The Simons, however, turned this down. Possibly as a result of the on-going dispute the Simons were not invited to an high-profile celebration of the tenth anniversary of the Otzi discovery in 2001. They have also found themselves to be expected to pay their way into the Otzi Museum - just like everybody else. In November, 2003, the Simons were legally recognised by the Italian courts as the "finders" of the Iceman mummy and therefore entitled, under Italian law, to one quarter of Oetzi's "value". The Museum, meanwhile, maintained that it was a not-for-profit organisation, with the millions being paid annually by the hundreds of thousands of visitors as entrance fees to the Iceman exhibition being spent on the upkeep of the museum and allied research projects. Moreover Oetzi could not be "sold" like a great work of art might be passed from one owner to another! Bolzano is an inherently attractive town in the highly scenic Dolomite mountain region but the presence of Otzi in the town must contribute to its prosperity as tourism centre. Ironically Helmut Simon met his own end in the freezing cold of the high mountains. In mid-October 2004, he had, at age 67, still been pursuing his passion for mountain walking and had set out, alone, for what should have been a modest four-hour round trip in mountains in Austria's Salzburg province. Helmut Simon failed to return as expected - there were heavy snowfalls and the temperatures were close to freezing - his body was recovered some eight days later. He had apparently fallen some 100 metres from a mountain path and died instantly. In May, 2010, after an almost twenty-year long dispute, the Simon family was awarded 175,00 Euros (including legal fees), in recognition of the Erika and Helmut Simons' role in the discovery and recovery of Ötzi. give rise to the "World" of, (non-ideological / non-doctrinaire), Human Societies!! !